This gorgeous and unique gift has a display of fresh seasonal flowers in a teacup with a double saucer set. 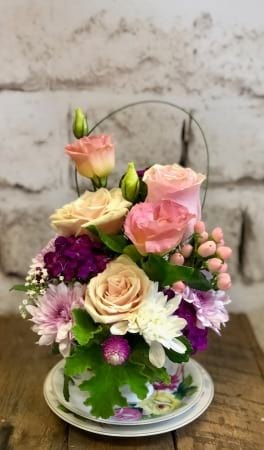 A unique and creative gift for Mothers Day, Birthday or Get Well. An ideal gift for the hospital, nursing home, home or office. Say I am thinking of you, or I love you with this fantastic design. Created by Amaranthine Flowers By Design, New Lambton Newcastle. Same day delivery available to all areas of Newcastle and Lake Macquarie, including John Hunter Hospital, Charlestown, Newcastle Private Hospital, Lake Macquarie Private Hospital, and Mater Hospital.